Do you know someone who has served or is currently serving in America's Armed Forces? Perhaps an uncle who fought in the Civil War? Possibly a grandfather who saw combat in World War II? How about close friends who survived Vietnam? Or maybe a husband, wife, son or daughter currently protecting our freedom in Afghanistan and Iraq? Military Tributes is the largest online collection of personal stories, awards, photos and videos dedicated to American Armed Forces personnel. If you have loved ones who have or currently are serving in any branch of the United States of America's Armed Forces, Military Tributes allows you to post the ultimate tribute to their military careers online - FOR FREE! Have you ever known anyone who served in any capacity of America's Armed Forces and never received the medals and awards they earned during their military service careers? 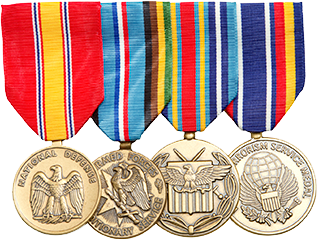 We also offer another service in which we can obtain those medals, ribbons and other awards from the U.S. government for you. If you simply want to know more about your loved one's military service career, we also offer personalized research services that can include research at the National Archives Records and Administration in Washington D.C. Contact us if you are interested in on our awards and research services! If you are interested in posting a military tribute, please begin the tribute process. It's quick and easy! Thank you for your support of our American Armed Forces!